At a New York City bagel store for some pre-Passover nourishment, I noticed a prominently placed new sign. "WARNING: Drinking Alcoholic Beverages During Pregnancy Can Cause Birth Defects." 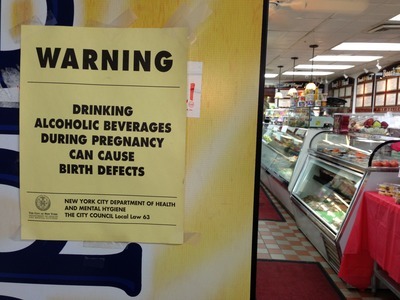 Sign warning of birth defects from drinking during pregnancy must be posted even in stores that do not sell alcoholic beverages. I asked the owner-manager of the bagel store if the store sold alcoholic beverages and he said no, it does not, but that the city maintains full-time employees whose job it is to go around making sure that stores post these signs even if no alcoholic beverages are available for purchase in the stores. I'm all for reducing birth defects, but forcibly enlisting a bagel store owner who doesn't sell alcohol in the anti-birth-defect campaign seems going a bit far. If the city wants to advertise against drinking during pregnancy, there is plenty of city-owned property on which such advertising might be conducted.